Discussion in 'LV Strip Hotels' started by Trademark24, May 5, 2016. I've been to Vegas twice.. the first time my wife and I went by ourselves and stayed at Aria (loved it), second time my wife and I went with another couple and we stayed at Monte Carlo (had a great time on the trip but Monte Carlo was definitely a big downgrade from Aria). This time I'm going on a guy's trip from Wednesday September 28th through Sunday October 2nd. Right now two of us are confirmed to be going, with a possibility of the number reaching four. My buddy who is for sure going with me has never been to Vegas. We are all in our late 20's age wise. We both like to play poker (cash games, 1/2 NL holdem mostly) and will also play some video poker, penny slots (really just for the free drinks) and some other lower dollar table games (not a huge gambling budget). I went on the Sin City club crawl last trip and had a blast so will be doing that again for sure. No real interest in seeing any shows this trip (went to quite a few with my wife last two trips and not really my cup of tea). We are also all big sports fans so we will be trying to watch and bet on some games while we are there. The first night we are actually going to be staying downtown at the Golden Nugget because I really enjoyed spending a day/half a day downtown on my previous two trips and want my buddy who has never been to Vegas to experience it as well. For Thursday, Friday and Saturday night I have narrowed it down to Aria, Bellagio, Planet Hollywood or Linq.. We would like to ideally book a room at around $150 or less per night, not including taxes and resort fees (which I acknowledge may be tough to find at Aria/Bellagio, but that $150/night isn't set in stone by any means). Linq has been the cheapest and PH not much more expensive from the research I've done thus far. We want a room with two queen beds in case it does in fact end up being four guys. Aside from the price, what we are looking for in a hotel would be a younger crowd/scene, a nice pool and a decent room (I felt like the standard room at Monte Carlo was kinda blah so would like something nicer than that, but not super important because we won't be spending a whole lot of time in the room). Central location is also what we are looking for, which I feel like all four of those hotels are pretty central. Definitely want the hotel we stay at to have a Poker room (that's why Cosmo wasn't in consideration, although I definitely enjoyed hanging out and gambling in that hotel on my previous trips). So just looking for advice/opinions on those 4 hotels and am certainly open to listening to any other suggestions of hotels that fit some of the criteria I outlined above. Also would love to hear if anyone has any tips for finding the best price on rooms and when would be the best time to book (got a good email offer on Golden Nugget so that night is booked already). Sorry for the long winded post and thank you in advance for the help! PH or Linq. Bellagio can get really quiet in the evening sometimes. I loved the room but hated the casino. PH has by far the most energy. Crappy pool, though. Linq is better. Based on your price range, Linq may be the only casino of the choices you mention. Maybe PH. You might want to consider mirage. I've seen Aria for as low as $155ish on some flash sales but for the 1 king room.. if it says 1 king there isn't a chance they would have 2 queens available? Bellagio is also the most expensive so I think I'll cross that one off the list.. PH has a crappy pool? What's crappy about it? How is Linq pool? I've heard it's small? I don't know if the Cosmo is way out your range price wise but it certainly ticks most of your boxes. Poker wise it would take you 10/15 minutes max to walk to, in my opinion, the best poker room in Vegas (Aria). I guarantee if you were to get a fountain view room then it would blow any Vegas newbies mind. Bellagio can get quiet? On a Friday or Saturday night? There is a constant herd of people tramping through the Bellagio walkway on Friday/Saturday nights. It might be quiet on a Tuesday night, but I think the Bellagio being too quiet is the least of your worries on weekend nights. PH pool is great! The FlowRider is a blast. Rooms, I think, would be nicer and a little bit larger for 4 than Linq. Lots of people, but not always a party type crowd. Just lots of traffic. I would throw in my two cents for Linq, P-Ho. If the OP played even a little at any CET property in the past, there might be a good deal on rooms. Login and check the rate calendar - NOT your offers. it's great if you want to hear ear numbing all the same type music. For me it comes down, without question, to PH and Linq. Both have their perks. I prefer the Linq just because I like playing at Cromwell, Harrahs and Flamingo as well, so being in that area is my preference. I find at PH, you're kind of away from everything else, with even Aria and Bally's being a bit of a walk (and I never play at Paris, just not my vibe). I LOVE the miracle mile and still spend many hours per trip at PH, but for my home base, I prefer the Linq. I've stayed there 4 straight times and despite staying at Caesars next week, I'm still kind of disappointed I'm not at the Linq. But I've always wanted to at least try Caesars and I'm being comp'd a Laurel Premium room with strip view (650 square feet) so I figured I might as well try it now while it's free and I have the gambling budget to do it. I'll always be comp'd at the linq even if my play drops off a bit in the future. Edit: Just re-read your original post. If you do book Linq, get the luxury room and not the standard room. The standard room (I believe called Deluxe) are very small and would be tight for four guys. Luxury room is just a tiny bit bigger (and barely more expensive usually) but makes a huge difference. I'd suggest taking a look at the Flamingo Go rooms. They are pretty interesting rooms, definately nice enough and not blah (though they are sort of over the top, it's kind of fun). As for everything you're looking for in a property I think the Flamingo has it all. The pool is awesome, the crowd is young (plus it's in the middle of everything) and that poker room is packed with fish until like 4:30am every night/morning. Easy hunting at the poker tables, always a game to be had and I had a blast my first trip there. I just have a couple of comments. As cjohnson said, the double queen at the Linq is small. I'll add that there is not much drawer and closet space in the rooms. The casino is nice and the Tag bar is great. The poker room is small but you can also play at Harrahs next door. Out of Aria and Bellagio, I would pick Aria for your needs, but price may be tough for either one of these places. Lots of great info to sort through.. thanks for all of the help! For PH.. will all of the rooms be renovated by my trip? I've read that the "Resort" rooms have been renovated as of today and the "Hip" rooms have not? Big difference between the resort vs. hip? I'll check out the LMT link.. looks like a good price. I've heard booking direct through the hotel's website is typically best bet but LMT looks like it's cheaper that what Aria is offering (I do have rewards cards with some "offers" but nothing spectacular). For 4 guys in their late 20s, get two rooms. Not one. If it ends up being just 3 of you, you could do one room and get a rollaway bed. Another question.. I have enough myvegas points to redeem the 25% off Aria rates.. is that truly a discount or I can pretty much find a sale with those prices if I look hard enough? ..I do have rewards cards with some "offers" but nothing spectacular). Login and check rates and NOT the offers. Sometimes you will find better deals. And, I would agree with others. Sharing a room with 4 guys is not my idea of fun. 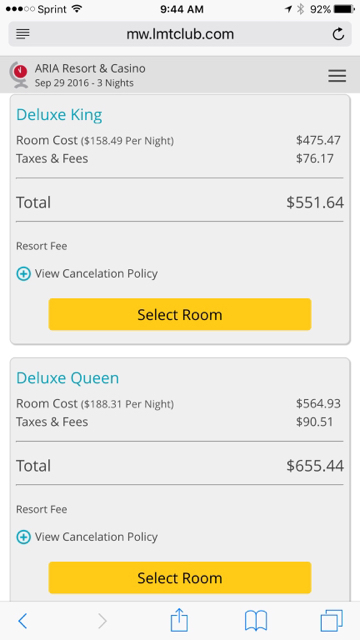 Just booked PH hip room 2 queens for $140 a night.. it was weird, going through Total Rewards rate calendar with coupon code INSIDER it came out to $165 a night, but when I used that code on the direct Planet Hollywood site, it was $140! Hey, i'll take it. Free cancelation so I'll still be looking around for any better deals, but thought it was too good to pass up. I may try to $20 trick to see if I can get upgraded to resort room when I get there? Thanks again for all the help everyone! Oh, do you think the renovations to the hip rooms will take place before September?